The next generation of the revolutionary self tuning EZ-EFI® has been upgraded with more features than ever before. Yet it maintains ease-of-use that doesn't require a laptop or tuning experience. As with the original EZ-EFI®, simply hook up the system, answer the Setup Wizard questions on the hand-held, and EZ-EFI 2.0® tunes itself as you drive. 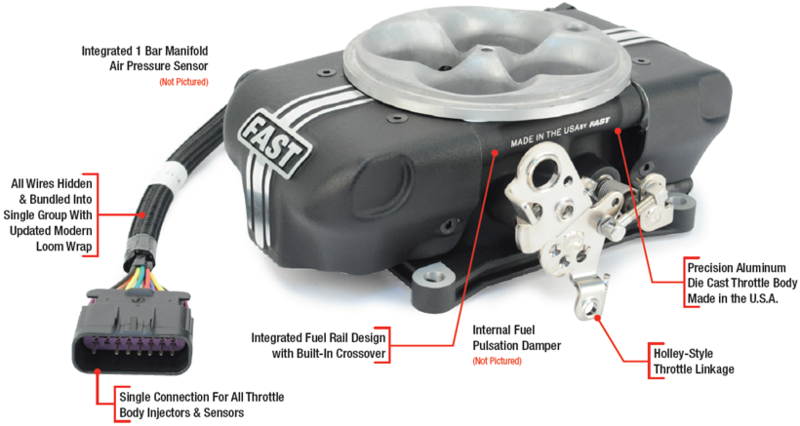 Its eight-injector, die cast throttle body features commonly available late model OEM sensors for accuracy and durability, supports up to 1200 horsepower (the highest on the market), includes optional ignition timing control and is able to run E85 fuels while competing versions cannot. 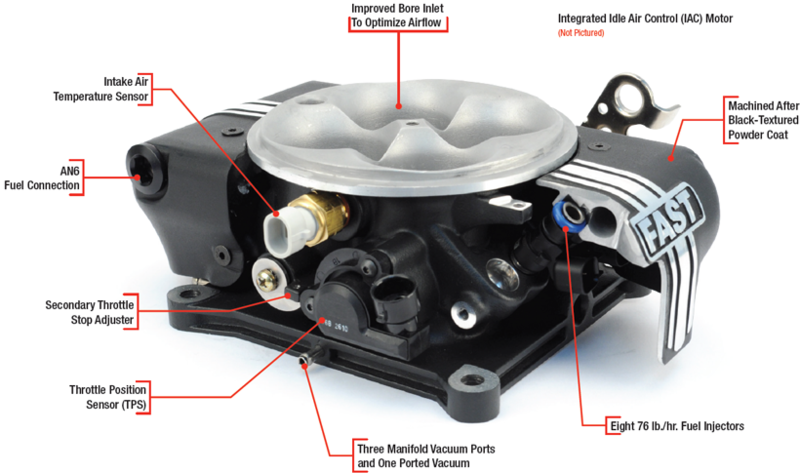 It flows more air than the first generation EZ-EFI® throttle body due to an improved inlet, while a new secondary shaft throttle stop adjustment provides even more precise idle airflow adjustment and balance. Meanwhile, an industry exclusive and unique-to-FAST™ integrated fuel pulse damper creates ultra-precise fuel control. The EZ-EFI 2.0® also incorporates needle-bearing supported shafts instead of bushings and an integrated fuel rail design with crossover for tighter packaging. Setup includes the market's fewest connection wires, including a new high-quality wiring harness and a sleek mesh-type loom. 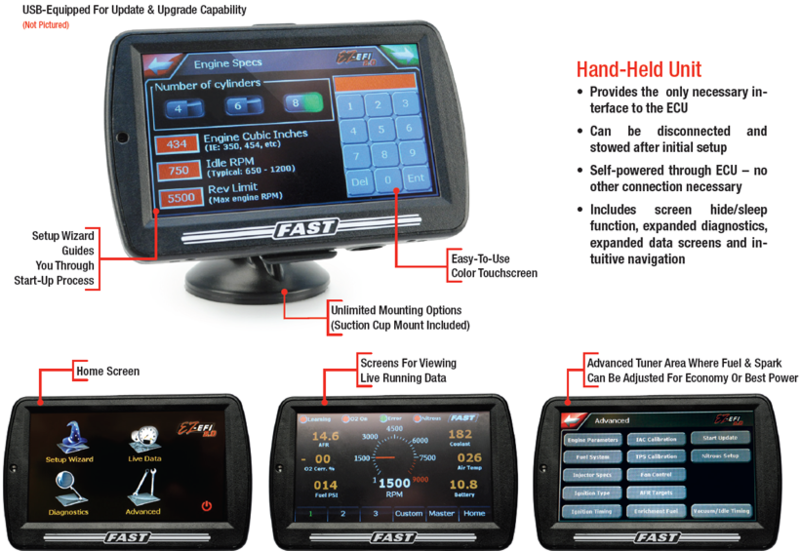 The EZ-EFI 2.0® has an updated hand-held as well, featuring the industry’s first color touchscreen. Self-powered through the ECU rather than requiring an outside power source, it shares the same mounting points as the Garmin Nuvi GPS, meaning there are nearly limitless mounting options (suction cup mount is included with all kits). Serving as the Setup Wizard initially, it then becomes an electronic gauge screen. The hand-held has various advanced features including screen hide/sleep function, expanded diagnostics and data screens, plus intuitive navigation. 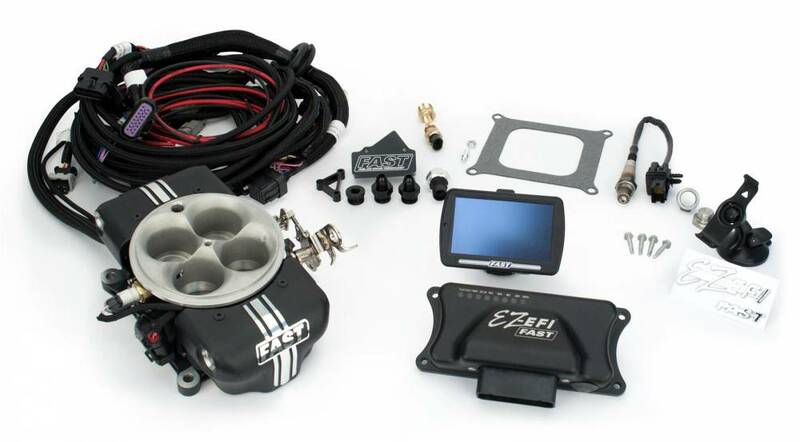 Electronic fuel pressure measurement is standard on all kits, and all kits work with a wet nitrous system, providing built-in nitrous timing retard and special nitrous AFR targeting. EZ-Ignition™ features an EZ-Solution™ option, meaning that it is plug-and-play with FAST™ Distributors for electronic timing control or can be used with an EFI distributor of your choice and a FAST™ Crank Trigger. Or the system can be used to control fuel only (Like original EZ-EFI®) and be used with a standard carb-type distributor (Ex. HEI) where timing is set manually.